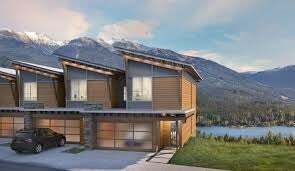 #26 Red Sky townhome offers a fabulous South facing exposure and delivers sunshine from dawn to dusk. Spacious three bedroom townhome ready to move in and enjoy. Offering stunning contemporary mountain architecture with extensive use of nature wood & stone. Built to a green standard, this unit has a spacious outdoor deck as well as ground floor patio, two car garage and is pre-wired for a security system & fiber optic. Located in close proximity to the Valley Trail network. The exclusive Baxter Creek Resident's Club featuring salt water pool, hot tub, change rooms and fire pit gatherings area are great perks for this development. Floor Area 2,152 Sq. Ft.